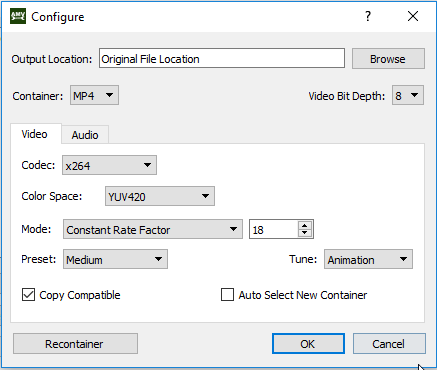 -Update to the way UT Video is interpreted for auto settings. -Fixed bug with audio stream selection in the configure menu. -Fixed bug with drag and drop rejecting files with capital letters in the file extension. -Fixed bug with external audio causing the encode to fail (Windows). -Added the ability to encode 10-bit x264. -Added the ability to encode 10 & 12-bit x265. -Added checks to enable or disable 10 & 12-bit encoding based on the copy of FFmpeg. -Fixed bug where RGBA would actually encode to RGB24. -Fixed bug where audio option "Copy Compatible" would check itself. -Fixed quirks with audio options. -Updated FFmpeg included with macOS & Windows releases to enable 10-bit x264, 10 & 12-bit x265, and FLAC. -Fixed bug for auto selection of color matrix for VapourSynth. -Fixed bug for auto selection of color matrix for AviSynth. -Fixed bug for auto selection of color matrix for videos. -Fixed bug for MPG audio in Windows. -Fixed bug for 2-Pass encoding where it would fail immediately. -Added High Bit-Depth support for Windows. Wow, nice tool! Thank you for making this! I'll be waiting for the 10bit conversion. I can't really see too much difference between using this and using the MKVExtractGUI (+MKVToolNix) and MyMP4Box combo, however I tried converting a 704x482 source with both your tool and my old method, and with the old method it changed the aspect ratio, but yours kept the aspect ratio, so thumbs up for that! I also think this is very useful for beginners, it's only one program that they need (basically) and it's also easy to use and it's fast, so I also recommended it for others. If you need help with translation into hungarian, feel free to tell me, I'll gladly help you! I'd have to see the specs on the original file and what exactly your settings were. That said, it should not change it enough to be an issue, especially for editing purposes. You can also tell your editing software to interpret the footage at a particular frame rate as well.